My friends Heather and Amy both have little ones that will celebrate their first birthdays in the month of September. So in honor of Lilly’s and Micah’s special days, I am sharing the recipe I used to make each of my children’s first birthday cake. I had two other friends who used this recipe within the past year for their little ones as well. It was originally a muffin recipe that I baked in 2, 9″ pans to make the cake. To make a traditional mini-cake, I used a cereal bowl to “trace” and cut out 2 small circles. I used plain greek yogurt sweetened with maple syrup for the frosting. 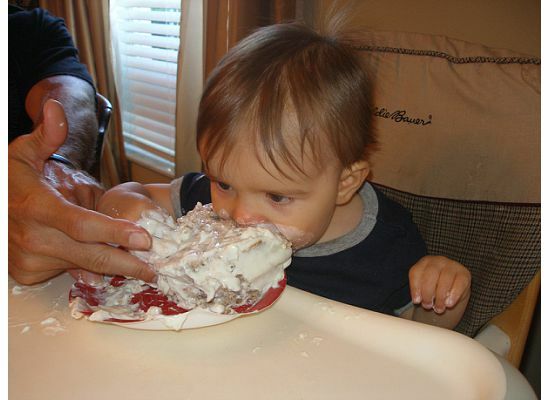 One of my friends mashed up banana and mixed it with the yogurt for her son’s frosting, and, according to mom, he continued saying “Mmmm!” as he ate it. the way full and bake 15-20 minutes. special treat by mixing in mini chocolate chips! Yes To Carrots and Kiwi Magazine GREAT DEALS!